Comece sua viagem de um dia em seu hotel em Liubliana, onde você encontrará seu guia e decolará em seu confortável ônibus. Sua primeira parada será em uma fazenda de couves Lipica (por conta do visitante) para ver a famosa raça de cavalos Lipizzan. Continue em direção à cidade pesqueira de Izola, onde você poderá desfrutar de um breve passeio turístico. 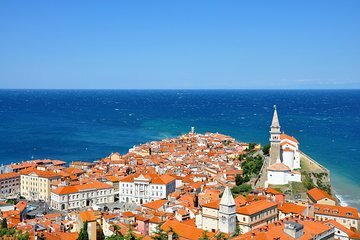 Em seguida, viaje para a cidade de Piran, na Ístria, e aprenda sobre sua arquitetura medieval enquanto passeia pela cidade antiga com seu guia. Relaxe com algum tempo livre para o almoço (por conta do visitante). Escolha um dos restaurantes tradicionais da região e experimente os pratos locais favoritos, como o risoto de choco. Depois, escolha um mergulho refrescante no Adriático ou espalhe-se na praia. Siga para a popular estância costeira de Portorož e termine o dia com uma visita ao Parque Natural Sečovlje Salina (por conta do visitante) para ver as salinas. Depois, admire a costa eslovena em um passeio relaxante de volta ao seu ponto de partida original. Very good tour. I am embarresed that I forgot my guides name, but she was very good. It was raining pretty hard and was supposed to rain most of the day. I asked my guide if we could shorten the 9.5 hour tour down to about 5-6 because of the weather. It ended up being a great tour that way for me spending most of the time on The Adriatic Coast. Really interesting day trip allowing ample time at Lipica Stud Farm - we had a carriage ride and a guided tour. We then had two and a half hours at Piran the pearl of the Slovenian Adriatic and totally idyllic which included a lunch break at our own expense. Finally a visit to the salt flats outside Portoroz which were also fascinating. Lana was our chauffeur guide for the day and there was just me and a friend on the trip. Make sure that you state that you want to visit all of the places listed on the itinerary and have the written details to hand. Otherwise the guide might try to short change you. Our tour was great. Our guide adapted our tour suit us. We learned so much, had fun, enjoyed our swim and the beautiful sights we saw. Fantastisk guide. Perfekt engelska, kunnig inom många områden. Mycket god kontakt, anpassade guidningen helt efter våra önskemål. rekommenderas starkt. Piran is an excellent town, beautiful scenary by the sea. We really enjoy it. The beach is a bit rocky for swimming. We had a wonderful time on this tour and highly recommend it. Piran is very picturesque and there are plenty of lovely restaurants to choose from for lunch during your free time. Our guide Vladamir was excellent, very chatty and knowledgable. The walking tour was optional but i'm glad we chose to do it as he took us down backstreets and showed us sights we most likely would not have seen if we had gone off on our own straight away. The salt fields were also really interesting and all in all it was a great day out! The coast is beautiful. Both towns are very small and there isn't very much to do...besides enjoy your surroundings. We went to the salt mines beforehand, which was interesting but seemed out of place on the tour. Our guide was nice but very difficult to understand...I only caught about 50 of what he was saying. Some people went swimming, the water is clear and pretty. Definitely a very relaxing day.